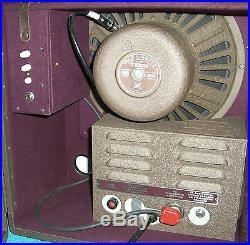 Vintage Bell & Howell Tube Amp – FilmoSound Amplifier w/12 Speaker – (Guitar/Harp Combo Amp). 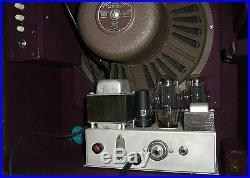 This is a Bell & Howell Filmosound Projector Tube Amplifier with a 12 speaker, which I believe is Jensen. It is in excellent condition, and has been tested in the projector (a video of which I have posted on Youtube). 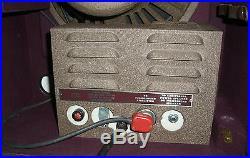 As well as posting a video of this amps features here. In the video here. The Filmosound amplifier is playing a short section of Dweezil Zappa’s guitar solo in the song Inca Roads. I disassembled the speaker and amplifier to ensure there were no surprises, and the pictures show that the speaker and amplifier are in superb condition. 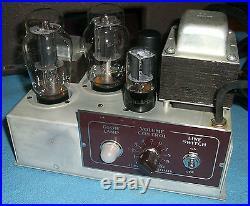 The vacuum tubes are (2) two 6L6G (1) one 5Z4 and (1) one 6SL7GT. 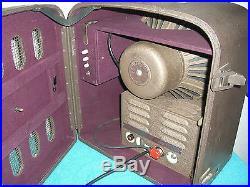 Please see the videos in the links above for more information on the amplifiers condition and functionality. 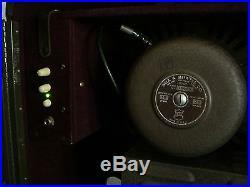 This tube amplifier and 12 speaker from the original projector normally has another tube amplifier (also for sale here) that provides the preamp for this speakers tube amplifier. In order to utilize this one enclosure, I have replaced that tube preamplifier with a small solid state amplifier that has a separate on/off control, and also provides additional tone and volume control. 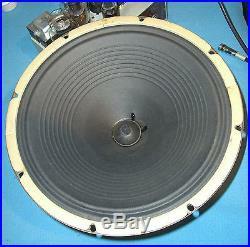 The amp also has an additional 1/4 speaker/audio out jack to allow for the use of an additional speaker. The pics show the physical condition. The pictures and/or videos are meant to be the main source of accurate description. Items that qualify for. All issues can be fixed by communicating, we prefer to have satisfied customers. 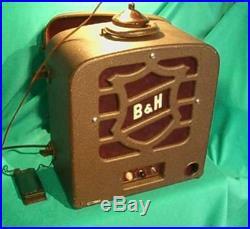 The item “Vtg Bell & Howell Filmosound Tube Amp with12 Speaker Guitar/Harp Combo Amp” is in sale since Monday, May 02, 2016. This item is in the category “Consumer Electronics\Vintage Electronics\Vintage Audio & Video\Vintage Amplifiers & Tube Amps”. 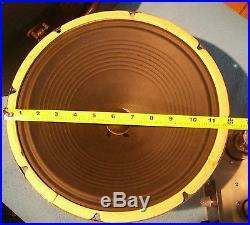 The seller is “tbhollow” and is located in Alturas, California. This item can be shipped to United States, Canada, United Kingdom, Denmark, Romania, Slovakia, Bulgaria, Czech republic, Finland, Hungary, Latvia, Lithuania, Malta, Estonia, Australia, Greece, Portugal, Cyprus, Slovenia, Japan, China, Sweden, South Korea, Indonesia, Taiwan, South africa, Thailand, Belgium, France, Hong Kong, Ireland, Netherlands, Poland, Spain, Italy, Germany, Austria, Russian federation, Israel, Mexico, New Zealand, Singapore, Switzerland, Norway, Saudi arabia, Ukraine, United arab emirates, Qatar, Kuwait, Bahrain, Croatia, Malaysia, Brazil, Chile, Colombia, Costa rica, Panama, Trinidad and tobago. This entry was posted on Tuesday, October 31st, 2017 at 12:31 pm	and is filed under bell. You can follow any responses to this entry through the RSS 2.0 feed. Both comments and pings are currently closed.